Caption Quetzalcoatl created humans and rules the fifth world cycle which nears it end on the winter solstice of 2012. He takes on different espects: Ehecatl god of the wind; Tlahuizcalpantechtli god of Venus as the morning star; Ce Acatl One Reed a warrior. 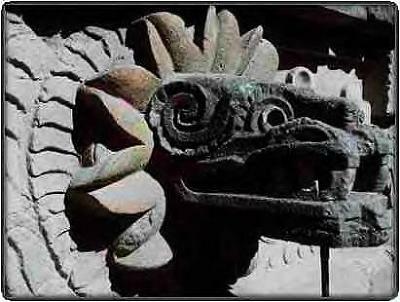 Quetzalcoatl represented the forces of good and light. The most benevolent of Aztec and Toltec gods Quetzalcoatl nightly would be swallowed by the sky goddess and resurrected every morning thus symbolizing the integration of the four directions with the self to find peace with the universe. Headline Quetzalcoatl in feathered serpent form.